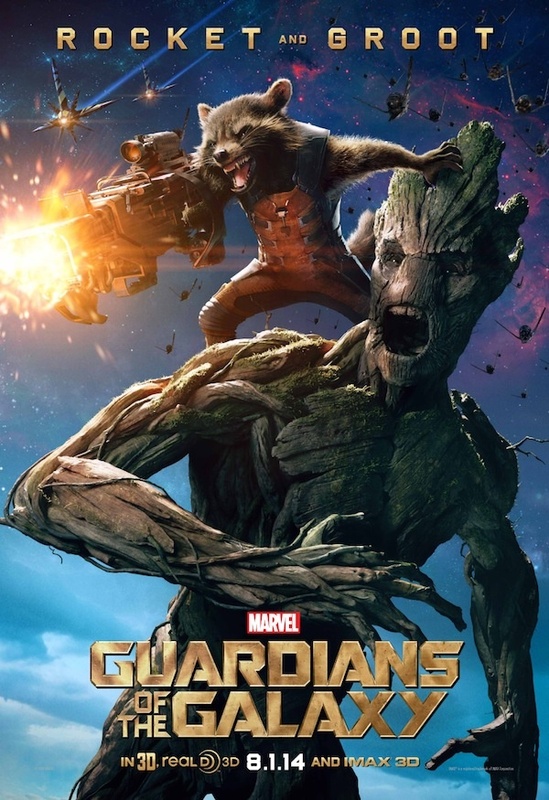 Marvel has launched a new series of character-centric film posters with the first focusing in on Rocket Raccoon and Groot. There's a bunch of reasons to go see Guardians of the Galaxy. The cast looks good, the tone seems light and the director has helped to write classic films like Scooby-Doo (and Slither, Super and Dawn of the Dead. When you really get down to it though, all they needed to do was show off the fact that the movie has a talking raccoon and a sentient tree voiced by Vin Diesel. Sincerely, can you think of a better reason to go see this film? Mind you, it's not that I'm expecting the rest of it to be bad or anything, it's just that this almost seems like a turning point of sorts for the film industry. For years comic films were run through a cinematic strainer, separating the mainstream acceptable content from the glorious goofiness that arguably makes comic books the wonderful things that they are. And now we've reached a point where a movie can not only star a raccoon, but actively advertise that it does. Case in point, Marvel has begun releasing a new series of character-centric posters for the film and the first to see the light of day is none other than one putting Rocket Raccoon and Groot front and center for the whole world to see. Granted, it took more than a few trailers nearly void of the two to get here, but I'd still be lying if I said that I didn't feel an urge to stand up and start a slow clap. It wouldn't amount to much because I'm writing this alone at my desk at home, but still, you can get what I'm driving at.